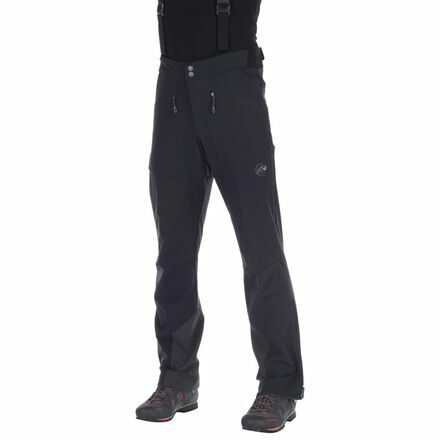 The Mammut Men's Base Jump SO Touring Pant provides the performance necessary for backcountry touring high in the alpine. Its Schoeller material is highly breathable and surprisingly robust, and there's plenty of stretch to ensure freedom of movement on the mountain. Mammut treated the Schoeller fabric with an all-organic ecorepel coating that offers long-lasting wind- and water-resistance to shed light snowfall and downhill spray. There are ventilation zippers at each side, and mesh linings keep snow out when you're letting cool air in. The suspenders are removable, and the adjustable waist ensures a secure fit without them.